Golden Retrievers are friendly and intelligent dogs, well-mannered, with great charm. They need essential nutrients for a superb coat and their digestion can benefit from prebiotic fibres. Regular exercise helps maintain optimal body conditions. Eukanuba Golden Retriever Chicken is a complete and balanced daily food designed to keep his coat shiny, support healthy joints and maintain stable digestion. Please visit our Breed Facts and Information for the Golden Retriever. Recommended For: Adult Golden Retriever (1+ years). Vitamin A (45551 IU/Kg), Vitamin D3 (1512 IU/Kg), Vitamin E (253 Mg/Kg), L-Carnitine (48.4 Mg/Kg), Beta-Carotene (5.0 Mg/Kg). Contain Basic Cobaltous Carbonate Monohydrate (0.56 Mg/Kg), Cupric Sulphate Pentahydrate (53 Mg/Kg), Potassium Iodide (3.9 Mg/Kg), Ferrous Sulphate Monohydrate (713 Mg/Kg), Manganous Sulphate Monohydrate (54 Mg/Kg), Manganous Oxide (38 Mg/Kg), Zinc Oxide (248 Mg/Kg). 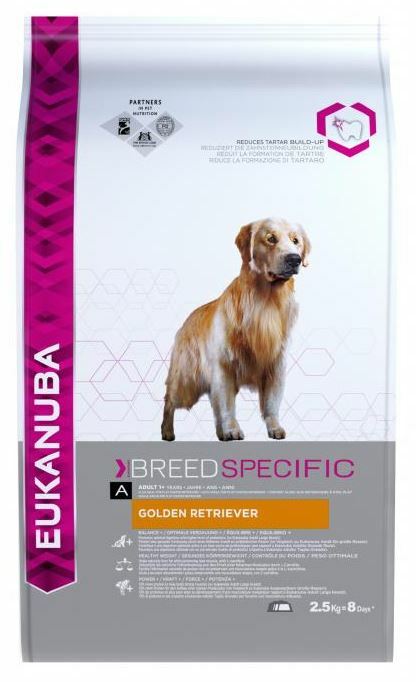 There are currently no questions for Eukanuba Adult Golden Retriever Chicken Dog Food - be the first to ask one!